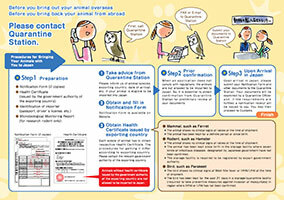 The Ministry of Health, Labour and Welfare of Japan commenced the notification system for importation of animals縲�in order to prevent outbreaks of zoonoses derived from imported animals on September 1, 2005. Under the system, any importer of animals (live terrestrial mammals, Live birds and carcasses of rodents and lagmorpha) is required to submit a written declaration giving the specified information on the animals to be imported, such as their species name and quantity, to the Minister of Health, Labour and Welfare (the quarantine station concerned), accompanied by a health certificate issued by the government authorities of the exporting country certifying that the animals are free from the infectious diseases specified for each species. 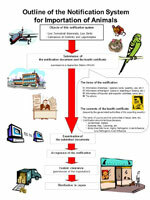 The system is aimed at taking prompt action (including follow-up) based on the declared information in the event of infections associated with imported animals, as well as ensuring the safety of imported animals themselves through a health certificate issued by the government authorities of the exporting country. Enforcement Regulation of the Act (No,99 of 1998) was revised and promulgated on March 17, 2016, and took effect on August 1, 2016. The columns 2 and 3 of Appended table 1-(5) of the Enforcement Regulation were revised as follows. For birds that have been raised since hatching, those that have been kept for the past 21 days or since hatching in a storage facility (limited to those with preventive measures against the invasion of mosquitoes) in regions that the Minister of Health, Labour and Welfare has designated as regions where highly pathogenic avian influenza or low pathogenic avian influenza has not been confirmed. Except for birds that have been raised since hatching, those that have been kept for the past 21 days or since hatching in a quarantine facility (limited to those with preventive measures against the invasion of mosquitoes) in a designated as region where highly pathogenic avian influenza or low pathogenic avian influenza has not been confirmed. The underlined parts are changes. 6 Statistical Information. 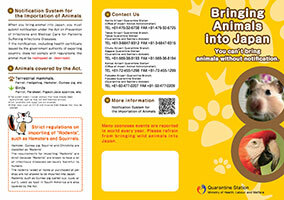 Animal Importation in Japan.